Makere University students get a taste of vEcotourism! Chimp-n-Sea project, vEcotourism.org, recently broke new ground as vEco’s Ugandan blogger and photographer, Mark Olokotum (a.k.a. Mark O! 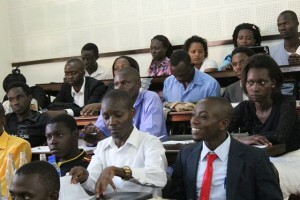 ), introduced students of the Department of Biological Sciences at Makerere University, Uganda, to the wonders and possibilities of vEcotourism on June 6th. Introduced by vEcotourism Tour Guide and Content Developer, Jackson Efitre, Mark O dazzled the group with stories about vEcotourism, its origins, how the tours are created, their potential and how the projects and partners featured within our vEcotours help local communities and work to protect wildlife and its habitat. Mark O also personally guided the group on a vEcotour through vEco’s Murchison falls and Albertine Escarpment. Following the talk, many of the students spent time immersing themselves in the various vEcotours on our website, connecting with vEco through social media and several people even wanted to volunteer and expand the potential of vEcotourism. To learn more about vEcotourism and to experience your own virtual tour, visit vEcotourism.org.